Back in 1997, when carsharing was just a funky thing only Québecois and Europeans did, Modo—or, as it was then called, the Co-operative Auto Network—started with two cars in Vancouver's West End. Flash forward 16 years to 2013 and we're celebrating our 300th vehicle! In addition to this milestone, we're also doubling our fleets in Surrey and Richmond and placing our first car in Coquitlam this fall. It's been a long road (so to speak), and we couldn't have arrived here without the tireless efforts of our staff and board, nor the continued commitment of members to live car-free—and tell their friends about it. Our growth could only be possible with your steady ambassadorship for sustainable transportation and love for your local car co-op. So, thank you, you're our heroes! Want to take your Modo co-op membership to the next level? 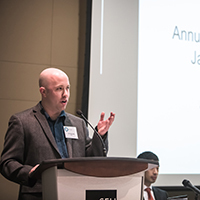 Nominations for our 2014 Board of Directors are now open! The Modo board comprises eight director positions, three of which are up for election this year. These three-year term vacancies will be filled at our Annual General Meeting in January 2014. All co-op members are eligible to run for election. Find more information and nomination materials on our website. At Modo's Special General Meeting on September 23, 2013, a resolution was passed allowing our Business members the opportunity to become share-holding co-op members. With this change, Business members may take a more active role in our co-op, giving them voting privileges at Modo General Meetings and a voice for their organization. Co-op membership is available only to incorporated organizations. In the coming weeks, Mona and I will be sending out further information, but until then, you know where to reach us! >> NEW COMMUNITY PARTNER Eastside Culture Crawl holds its annual 3-day art extravaganza, November 15–17. Tell your friends about Modo's special offer for Crawl patrons! >> PRO TIP: Modo shares more than cars—we also share our data. Take a look at our API! >> PRO TIP: Did you know you can make your Modo login more convenient? Claim your username! >> THANK YOU to all the volunteers who pitched in to make #dinnerpartyYVR such a resounding success! Metro Vancouver is conducting a study about carshare usage and its impacts on household vehicle ownership and parking demand. TAKE THE SURVEY about your experience to provide valuable information for municipalities, developers and carshare organizations like Modo to expand carsharing in the future. And yes, there are prizes. All responses are confidential, and Metro Vancouver asks that only one survey be completed per household. Thank you! SHAW TV: "Join. Book. Go." Throughout November, Modo will be airing a 30-second spot on Shaw TV. Here's a peek at the video with music by, and starring, our friends The Ruffled Feathers. Modo and Vancity have a longstanding relationshop going back to our founding in 1997. We are evidence of co-ops working better together. Thanks to their team for creating this gorgeous video about our shared impact on the community. 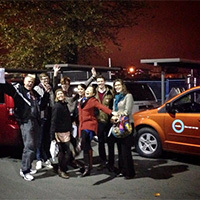 It's no secret, Modo's volunteers are truly awesome—especially when we band together for unique events like #dinnerpartyYVR, where Team Modo (pictured) provided safe rides to charity donors! JOIN Tommy Laflamme and other fellow members at future events—and score a $20 carsharing credit!—by emailing tommy@modo.coop. The 2014 Hope In Shadows calendar is now available for purchase from street vendors in Vancouver and North Vancouver. By attending a basic sales training session, low-income people are licensed to sell these $20 calendars, from which they make a $10 profit. As sponsor, Modo was fortunate to attend the calendar launch event earlier this month, and the photos this year are stunning! This evening, 6–8pm, the parking-spot-sized parklet Park-a-Park is celebrating the end of its pilot phase with a bon voyage hot chocolate gathering at its current location, Marpole Neighbourhood House. Julien Thomas, Park-a-Park's creator, has been a great partner to Modo this year, so drop by to toast to the success of this unique mobile community hub and portend for the future of Vancouver public space! 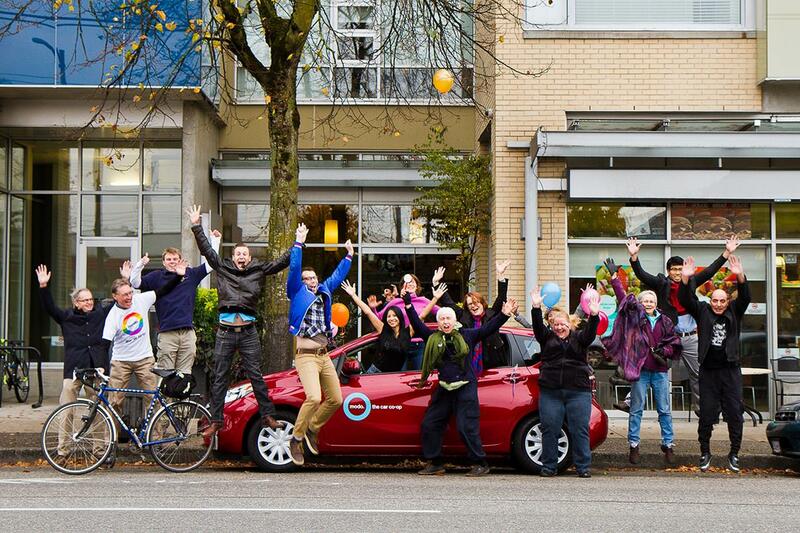 This evening, 6-9pm, join Modo to celebrate our 300th vehicle at District Main (4453 Main Street, at 28th Avenue)! Our team will be on hand to answer questions for people new to (or experienced with) carsharing, as well as chat with local neighbours and businesses. See you there! Modo is thrilled to be a platinum sponsor of this year's Eastside Culture Crawl! With 406 artists showing their galleries from November 15–17, the ECC is presenting preview nights to help you take in as much art as possible. This evening, visit the Firehall Arts Centre from 5:30–7pm for a sneak peek of this year's new artists. On November 6, 6–8pm, The Cultch will host its annual ECC Preview Exhibit; and on November 14, 6–9pm, several artists will open their studios for an early showing. There's a lot to see this year, so plan ahead, wear good shoes and book a Modo to make your gallery hopping a breeze! Major decisions about the future of transportation across the Lower Mainland are soon to be made. On Thursday, October 31, 7:30am–2:30pm, join Modo Executive Director Phil Baudin, along with community, business, political and economic leaders and experts in this important debate at Moving the Future: A New Conversation About Transportation and the Economy. Note: There is currently a waitlist for this free event through Eventbrite. The Vancouver Park Board is currently developing a long-range master plan for how John Hendry Park will evolve over the next 10–15 years. Modo Community Partner Vancouver Farmers Markets has a strong presence in this area through the city's oldest market, Trout Lake Farmers Market. Does a permanent home for this longstanding community fixture belong in the John Hendry Park master plan? Have your say in the park's future by completing the Park Board survey! Note: the John Hendry Park survey closes November 1 at midnight. What role do we as citizens and taxpayers play in influencing the development of the place we call home? Lead by the St. George Rainway Creek Stewards, The Creek Forum is designed to engage community stakeholders in examining what a potential redesign of the headwaters of the St. George Creek could look like. Activities will take place rain or shine, 10:30am–2pm, with St. George Street being closed from Kingsway to 13th Avenue. For more information, visit the Facebook event page. The Vancouver Park Board is currently improving Hillcrest and Riley Parks. On November 7 from 5–8pm, there will be a public open house at Hillcrest Centre to discuss the Master Plan for these areas and receive current project updates. With Modo vehicles in the area, this open house may be of interest to local members. Our Community Partner Vancouver Farmers Markets will also be attending to support the construction of a permanent home for market activities in the summer. Now that you've taken in some previews, it's time for the main act! Beginning on November 15, 5–10pm, the 17th annual Eastside Culture Crawl kicks off throughout East Vancouver. Gallery and artists spaces will be open for public viewing so you can chat with the creators in their own space and maybe find a new favourite piece of art! The ECC continues through the weekend, November 16 and 17, 11am–6pm. 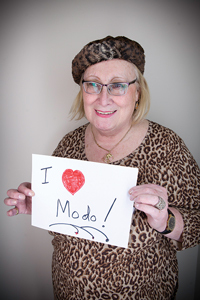 Keep an eye out for our Modo booth and enthusiastic volunteers at 1000 Parker Street, a great jumping off point where you'll find hundreds of visual artists, furniture designers and craftpeople and the ECC HQ! Join the staff and board of DOXA Documentary Film Festival on November 18 at 7pm for their Annual General Meeting. The DOXA team will review programming and administrative highlights from the previous year, serve light refreshments and give a sneak peek at this year's plans for the Motion Picture Film Series. If you purchased a DOXA membership for the 2013 festival, you are a voting member and encouraged to attend. The DOXA office is at Suite 5, 1726 Commercial Drive. 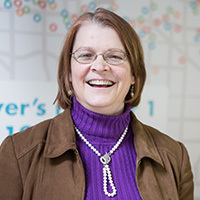 Join OpenMedia.ca and Gen Why Media for Bring Your Boomers #5, an evening of intergenerational dialogue, stories, theatre and dance that celebrate people-powered solutions to our collective challenges. This edition of BYB explores issues and potential solutions surrounding our government, our privacy and natural resource extraction and features National Geographic Explorer-In-Residence Wade Davis. Doors at 6:30pm with event beginning at 7pm. Find tickets on Eventbrite. Interested in becoming part of the Modo Board of Directors? A general information session for members interested in running for this year's board vacancies starts at 7pm (location TBD). Email nominations@modo.coop for details and to RSVP. After an inspiring week of events in Vancouver, our Community Partners at Living The New Economy will gather in Victoria to share ideas and resources to help people thrive in the New Economy. If you find yourself in Victoria during this event, or have friends who would be interested, share the link and take a look at their schedule to make your plans! Tickets are available via Eventbrite. Our Nissan NV 200 cargo van (#460) is back from a long repair! We thank all our members for their patience while we got this van back on the road. Our 2010 red Dodge Grand Caravan (#320) continues to live at Knightsbridge while we put the finishing touches on its permanent home. A 2012 white Chevy Orlando (#486) can now be found in front of 1238 Melville Street, between Jervis and Bute. The designated stall is on the south side of the street. After a year at Coal Harbour Community Centre, our electric Nissan Leaf (#328) has moved to allow members located elsewhere in the city to try the all-electric vehicle. The Nissan Versa (#376) remains at this location. A 2013 grey Nissan Versa sedan (#438) has replaced the 2006 Toyota Corolla. A 2014 blue Nissan Versa Note (#497) is parked here temporarily. A 2014 blue Nissan Versa Note (#482) has replaced the 2006 Toyota Matrix. We've abandoned our location at Lakewood & E 1st and moved the 2013 red Toyota Prius C (#458) to a new location at Lord Nelson School. The car is in the 2100 block of Kitchener Street, between Lakewood and Templeton. Park on the north side of the street, next to the Lord Nelson School playground. We've abandoned our location at E 3rd & Semlin, and moved our 2009 red Mazda 3 sedan (#261) to a new location at Lakewood & E 2nd. The car is on Lakewood Drive, between 1st and 2nd. Park on the west side of the street, in front of 1757 Lakewood Drive. A 2013 red Nissan Versa Note (#492) can now be found in the parkade beneath 4453 Main Street, between East 28th and 29th Avenues. Enter the building from Main Street, through a single door just left of the lobby entrance. Take the elevator down to level P1. Turn right as you leave the elevator, then left when you enter the parkade. A 2010 red Toyota Prius (#285) can now be found in front of 233 East 11th Avenue, between Watson and Sophia. There is a designated Modo stall on the north side of the street. A 2010 blue Ford Ranger (#323), a 2012 grey Chevy Orlando (#484), a 2014 blue Nissan Versa Note (#485) have replaced the 2007 Toyota Yaris hatch, 2008 Toyota Matrix and 2011 Dodge Grand Caravan. A 2014 blue Nissan Versa sedan (#488) has replaced the 2013 grey Nissan Versa sedan. A 2013 blue Toyota Prius C (#493) is parked here temporarily. Laurel now features a 2007 blue Toyota Yaris hatch (#197) instead of a pickup truck (which has moved to City Hall Surface Lot, a few blocks closer to the transit line). A 2011 all-electric red Nissan Leaf (#328) has joined the existing Toyota Prius C.
Just north of the Edmonds SkyTrain station, find a 2013 white Chevy Orlando (#498) parked in the 7400 block of Salisbury Avenue, between Edmonds Street and 21st Avenue. Park on the east side of the street, as close to Edmonds as possible. A 2013 silver Nissan Sentra (#483) has replaced the 2010 Mazda 3 sedan.